Replaces the cart cloth found in Tribunal with a higher resolution texture. Includes an alternative texture as well. Fixes vertex shading and UV maps on the cart mesh. 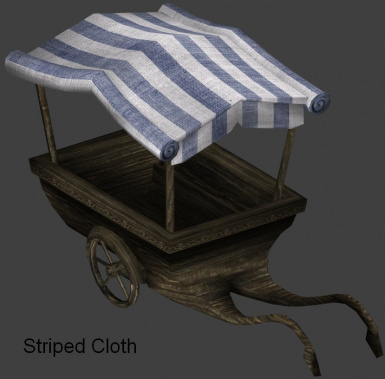 Replaces the cart cloth found in Tribunal with a higher resolution texture that maintains the look and feel of the original. Includes an alternative texture as well. 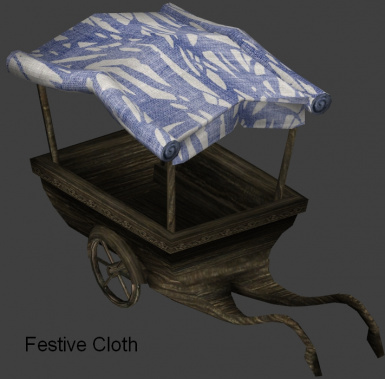 This mod replaces the texture for the cloth found on the carts in the Great Bazaar in Mournhold. The texture is hi-res, 512x512, in .dds format. The texture mainatins the original look and feel of the vanilla texture - it even has the correct number of blue and white stripes! + Also, I've made available an alternative download that has a more festive pattern, though in the same blue-and-white coloring as the original striped cloth. Also replaces the cart mesh with the same mesh, but with tweaked vertex shading and UV map. All downloads contain a readme. + CCR_Normal: contains one hi-res texture that maintains the look and feel of the vanilla cart cloth. Contains tweaked mesh. + CCR_Festive: contains one hi-res texture with a leafy pattern, but maintains the vanilla color scheme. Contains tweaked mesh. 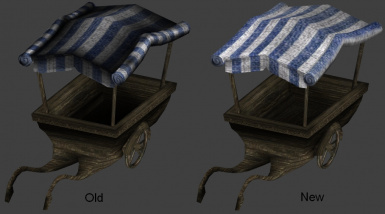 This mod will conflict with another mod that replaces the cart cloth texture and/or cart mesh. If the mod uses an .esp, then that mod will probably overwrite this one anyway. 2.0, 2010/12/18 - updated with tweaked mesh. 1.0, 2009/1/06 - Initial release.